You are currently browsing the tag archive for the ‘AVD Error’ tag. I updated my Android SDK, downloaded the new packages, everything went pretty well. Than i started a test android project. When i tried to RUN it, the Android Virtual Device (AVD) gave me this error. I tried every possible tweaking to the eclipse configuration and SDK configuration. Tried alot of things with the AVD Manager but nothing worked. Here is wat solved the problem for me. I copied the installed Android SDK i.e, android-sdk-windows-1.5_r3 from my g:\(some nested folders)\android-sdk-windows-1.5_r3 to C:\android-sdk-windows-1.5_r3. 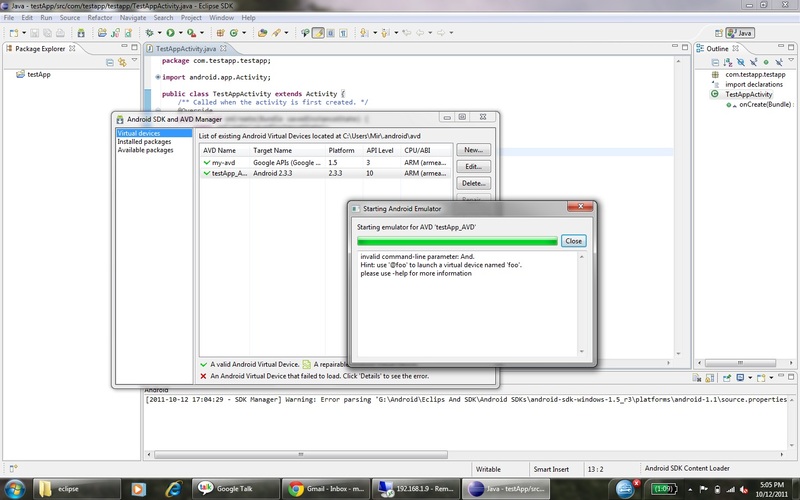 Than i reconfigured the path in eclipse for android SDK and started the AVD. walah… it worked. Reason:- There were white spaces in the folder names in the previous path that was creating the AVD to raise this stupid error. So to solve the problem either u have to remove the white spaces from the path that u r using or u have to move the SDK to the root of some drive and remove white spaces from the folder name of the SDK or u can even u even use the path from the command prompt that removes white spaces and converts the path to a single string using ~ sign. Still if this sounds too complicated we can use one of the first two techniques to solve the problem.